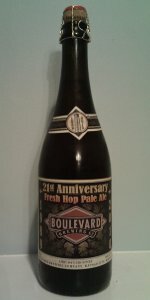 21st Anniversary Fresh Hop Pale Ale | Boulevard Brewing Co. In November of 1989, John McDonald loaded his pickup and drove three blocks down the street to deliver the very first keg of Boulevard beer. Though significantly more assertive, Boulevard 21st Anniversary Fresh Hop Pale Ale is brewed in loving tribute to that original Pale Ale. English pale malt gives the brew a rich, nutty malt flavor. Munich and Caramel malts add color and body, while a blend of Cascade, Hallertau, Magnum, Styrian Golding, and Centennial hops contribute scintillating citrus aromas and complex, peppery notes. 750ml corked and caged poured a couple times into a Bass pub glass. Nice deep amber color, with a fluffy, bubbly, generous 3 finger head with good retention but not a whole lot of lace. Took a whiff of the cork after it popped and wow there was some permeated fresh hop aromas in it! Aroma was very woodsy, piny, floral, grassy and definitely of fresh hops/bitterness. There's some predominant malt backbones in there, mostly of the sweetish caramel persuasion. Good bit of floral hops in the taste, with some good bits of citrus as well. Malts were a bit more underlying than in the aroma, but there and provide good balance. Pleasant bitter finish. The feel is light, slightly creamy textured, a bit of a carbonation bite, though the carbonation is overall adequate. I won't have any trouble putting the 25.4oz's away, so, drinkability is solid. 750ml brown magnum with a vintage date on the label. Tiny bubbled egg shell color head leaves a think curtain of lace on the glass. Maroon-ish amber color with only a sight haze from the hops. Minty, peppery, leafy and citric peel freshness in the nose from the hops. Smooth and creamy lush malty body. The hop bitterness stay pretty mellow, just a low level of prickliness. The flavor however is layered on thick with orange peel, blond tobacco, and peppercorn. Alcohol jumps in with a splash of apple and pear fruitiness. Oh yeah, there is malt year ... a great base of it with a hint of caramel and biscuit. Leafy dryness in the end. I really do love these fresh hop ales, BLVD does a great job here and I certainly received my hop fix here. Poured from a 750ml corked and caged bottle into a tulip glass. I thought I was never going to get that cork out. Had an issue with the last several Boulevards and corks. Getting to be a bit annoying. Best by date on 6/11 on back label. This was just released and store got it a week ago so it's fresh. Oh yeah! It was a very hazy amber color with good carb from the etching. It had a massive 2+ finger foamy head that very slowly settled into a good collar and foam cap. Good lacing with a little sticking. The aroma was excellent with pine and citric hops blending with the English malt. Caramel. Excellent for an APA and worth lots of sniffs throughout. The taste was also excellent. Starts out with a solid caramel malt base. In the middle, the spicy hops kick in for a great flavor burst. Towards the end, the bitter pine hops start to ramp up for a good mild bitter finish that doesn't linger too long. Really liked this one especially the middle. Mouthfeel was nice and chewy with good carb levels and great aftertaste. Cinnamon muted orangey brown hue that sits like a solid form of candle wax in the glass. A tall and fluffy beige tinted crown of foam lifts quickly to top it off. Slowly dwindling down to a skim and collar that stays present throughout. Minimal spotty lacing is flung about. Aroma is dryish and woody with a nice twist of grapefruit and orange peel within each wiff. Munich and caramel malt is lightly laying groundwork in background. A solid smelling Pale. Taste is made up mostly of dull orange tones dusted with wood notes, floral hops, and a light under current of pale, caramel, and Munich malty sweetness and bread flour. Bitterness is playfully buzzed in crusty woodyness and a splash of grapefruit tinge. Body is a mealy medium in malt with an airy dryness in hops and yeast floating about. Carbonation level is medium and a bit edgey. Leaves a nice deep woody tang of tone late across the finish. A very solid Pale, well-crafted with a fairly good balance, but a bit disappointing for an Anniversary brew given what the Smokestack series Boulevard has been crafting. And at $12 a 750, Harvest Dance is what I'd much rather grab; that is, if ya can still find it? A - Pours a solid brown color, opaque but not hazy. Not much suspended yeast. Head formation is light, breaks down to a film. Not much apparent carbonation. S - Very light orange, citrus like hop scent. Some piney notes are present. Overall it is very unassertive. T - Starts off with some light caramel, smooth sweet malts. Mid-stream you get that very earthy, resinous fresh hop scent. Finishes with a strong bitterness, tongue grabbing bitterness. Some lingering hop piney notes are retained. M - Moderate body - at times seems a little thin. Carbonation is very noticeable on the palette. Finishes clean. D - Moderate drinkability. ABV is high for an APA, but not extreme - so not a great session beer. Not excessively filling. The fresh hop flavors can make you a little palette weary. A nice offering from the company that started me on craft beer. Thanks to hwwty4 for this 750 mL corked and caged bottle. A little late for a harvest ale, so it was opened immediately. A: The ale has a harvesty auburn look, dark ferrous hues that leave the ale generally opaque. A sizeable head, over a finger, accompanied the first pour and laced as it receded. S: The nose has a strong caramel presence, making up for the degraded hops. The hops that remain have lost the harvest edge but retain a citrusy taste. T: Caramel malts, bready with an English toffee vibe, start things off right. The chewiness makes up for the reduced hop presence. Those hops, citrusy, still have a strong rind and grapefruit taste. In hindsight, I'm pleased with how the ale has held up. M: The mouthfeel is malty, a bready meal in a bottle. The hops remain vibrant enough to feel like a harvest ale. D: A split the bottle with a friend, a better way to make my way through it. A decent harvest ale that has aged out well. 750ml bottle, best by 06/2011. Pours a hazy tea amber with a medium creamy off white head that retains well and leaves a little lacing. The aroma is bready caramel and crystal malts with some grassy fruity hops. The flavor is some grassy hops and a little melon and resin with light to medium bitterness in the finish. The mouthfeel is medium bodied with slightly sharp carbonation. Overall, I was a bit disappointed. The flavors were kind of bland and I didn't care for them. Blazing bonfire orange with bright tangerine borders and a massive crown of pillowy foam that is some combination of pale orange, ivory and ecru. Shallow divots form in the upper surface with melting and plenty of good looking lace makes it to the glass. The hop bill is an United Nations affair and includes varieties from this country, England and Germany. The Americans (grapefruit and orange) still rule the roost, but aren't as tremendous as they would have been if they were the only roosters in the barn... or something like that. Every bottle of Boulevard 21st Anniversary Fresh Hop Pale Ale in your possession (or on your shopping list) should be consumed sooner rather than later. That's because this is not a devastatingly hoppy brew by any means. It's still hoppy good, it just isn't really, really hoppy good. Part of the reason for the less than impressive hop flavor punch is a selection of malts that includes toasted-earthy-nutty Munich alongside pale and caramel. Munich almost always spoils the mouth party for me, though to be fair, there isn't a ton of it here. As expected, the hops deliver a combination of citrus peel, herbs and grasses. It's all pretty pleasant, and the semi-biting bitterness seems to be building as the alpha acids accumulate with each mouthful. Picking a 'best by' date of 06/2011 is laughable. This offering will be a shadow of its present self by New Year's day. Despite impressive foam creation with each pour, it doesn't feel like there are enough bubbles to go around. The beer collapses a little too quickly, but is big enough to start with that it still deserves the above score. When it comes to hoppy APAs/IPAs/DIPAs from Boulevard Brewing, the gold medal goes to Single Wide IPA, the silver to 21st Anniversary Fresh Hop Pale Ale, and the bronze to Double Wide IPA. All are rock-solid, none are spectacular. I'm still glad that all three are available mere minutes from my front door. Poured into my new tulip glass from a 750ml bottle. A- Pours a nice strong amber color with some slight copper colors and a nice white .5 inc head. The head is quite dense and has some good retention. Nice tight bubbles along with some bigger bubbles around. S - Aroma starts off with some very nice grassy hops that are very well intertwined with quite a delicious and prevalent malt grain backbone. This Pale Ale has a very good malt nose on it. Grainy and slightly sweet with a nice bready pale malt taste and slight caramel notes. The grassy hops work well together in the nose with the slightly sweet bready malt. T & M - Starts off with some slight bready notes from the malt but this is quickly met up with some perfectly balancing mix of awesome hops. This might be one of the most well balanced APA ever. It is mighty good. A well brewed beer by a great Midwestern brewery. The grassy hops linger as the beer goes down leaving a nice fresh mouthfeel. There is a good emphasis on the malts in this APA unlike some that tend to forget about the other ingredient in favor of the edgier hops. This beer has some great bready notes. The beer is smooth, clean and crisp at the same time. Good medium body and a nice bitter and semi-dry finish. D - Delicious Anniversary brew. Well deserved celebration. A higher ABV is present but it isn't too crazy. Overall a good APA. Yum. Not a bad brew. Served at a good temperature with a nice sized, cream colored head that lasted a while and lots of lace. Color is slightly hazy honey amber. Aroma is hop, caramel, wet grain, solvent. Flavor is exactly the same: alll a that plus carbonic tang yet the solvens play a big role. Body n carbonation are good. Finish is like flavor and balanced. good beer. Pours an orange amber with a nice fizzy head. Aroma is very much hop forward, with notes of grapefruit, grass, and some pine in the background. Taste is very much crisp and clean, with a pleasant lingering bitterness. The caramel and biscuity malt profile keep you coming back for more. My first thoughts when tasting the beer is that it's fresh - maybe that's the marketing speak in the back of my head talking. Mouthfeel is medium bodied, with a nice carbonation level that keeps things from being watery. This beer is very full flavored, it's like a souped-up version of Boulevard's normal Pale Ale. As a fan of that beer I find this one quite tasty. Spring is here when an evening of yard work results in a pour of a beer that showcases best the light bready malts and sharp, crisp hops that resemble fresh cut grasses and herbs, mild grapefruit, orange zest and pine resin. Aaah, summer is close! The pour of Boulevard's 21st Anniversary Fresh hop Ale brings a medium amber, deep copper color with a standard dry-hopped haze. The head proves froathy, dense, and to form a creme that sheets the surface as the lace begins to fall mid way through the session. Perhaps hinting toward a heavier version of the style...., perhaps not? Aromas of mild grapefruit hops start to suggest American roots, but then the earthy hops of grassy, leafy, earthy-spice say equal in the vein of English varieties. When expecting crisp and clean malt caramel notes (sure they're there) but an added bready, biscuity note also resides. The beer seems to borrow what's best about English and American IPA's but with the freshly picked hop aroma at the forefront. Medium, medium, and more medium seems to the motive of operation for taste, the balance starts with a bready/biscuity caramel taste that's a brilliat couterpart to the grassy, citrusy, piney hop flavor. As a huge attribute, the beer's maltiness and fresh hop character holds onto it's structure until very late in taste where the malt dies off and the spicy hop bitterness of English hops develops into a drying and earthy finish. Brilliant yet complexly earthy all at once. It'll be interesting to see how well this beer is recieved. Medium creminess early is a direct result of dense English/American malts and medium creaminess. As the initial carbonation subsides, the weight of malt moves in... but so do the hops that have just developed from citrusy flavors to sharp bitterness, and into fleeting dryness. Combined with alcohol, the beer finishes decidedly dry, minty-fresh finish, but not without a simple linger of malt richness that defiantly hangs in. This is a very enjoyable beer that has an Engish attitued throughout, but also employs a bit of grapefruity hops to bring out a citrusy fruitiess that brightens the beer, along with a crisper body that English beers don't achieve. Still a touch of leafy character gives as much of a fresh element as it does vegital. After using the Jaws of Life to remove the cork (I mean, c'mon Boulevard, are these corks cemented in? ), the beer pours a deep copper with a nice, but quick soft white head, which is the weak part of appearance. Aroma is a tad spicy and citrusy. although not overly so. Some semi-dark malt comes through, but isn't as 'bready' as expected. I love the flavor. For a PA this hits the spot. Not as citrusy or piney as some other PAs, say SNevada, but it does have a nice clean combination of the two. A touch of caramel, bread, very faint dark roast. slight spice. A nice collection of flavors here. Like a celebration. Crisp finish, could use a bit more pizzaz or something to cleanse the palate a bit more. 750 ml corked and caged bottle, poured into a Smokestack chalice. A dense ivory colored head initially goes up the the rim of the glass, then slides down to the surface. A tight lace sits on the surface and then wraps around the glass with each sip. Body color is a burnt orange. Light comes through but the clarity is hazy. Lazy carbonation drifts around the glass. Hops take center stage to the smell, but these are not the aggressive hops of an American IPA or DIPA. Tropical fruits like tangerines, mangoes and pineapple have a relaxed sweetness. The hops add a pine needle layer to the front taste. Red grapefruit finishes out the after taste. Sweet, tart and fruity. Mouthfeel has a light, fluffy character with a slightly oily slickness. There is a juicy stickiness on the roof of my mouth. It's like ruby red grapefruit juice. I get the feeling that the full force of the hops have been balanced out by the pale malts. A great homage to the original midwest American Pale Ales. Big thanks to Tulsa BA thehand for a shot at this one. A-Dark, hazed burnt sunset, golden muddy copper with a thick off-white head that slowly reduced to a thin cap and left decorative lace. S-Significant orange esters with a complex amalgamation of wet leaves, hay, lemon zest, tropical fruit and musty earth. T-Spicy orange up front with musty notes of earth, pine and lemon zest. Touches of malty sweetness add depth, balance and body in the background. Ends with a drying flourish. M-Medium bodied and somewhat sticky from all of that hop resin floating around! Lingering hop bitterness is present but doesn't last long. Being a wet hopped brew this doesn't shock me. Dryness kicks in more and more with warming. D-Good stuff. Boulevard always does good stuff within the Smokestack series and this one is no exception. A totally solid, drinkable and enjoyable harvest ale. Poured from a corked and caged 750ml bottle into a Boulevard tulip. Special thanks to mikennat for this from our recent trade! A: Pours a clear tarnished copper color. Two fingers of off white cream on top that immediately evaporated to nothing. No skim, collar, or lace. Really kind of ugly. The second pour brought what I was looking for. Same color, but nice and hazy. One more finger of foam, with staying power, and sticky lace. Carbonation was on the lower side of medium. S: Not what I expected, right off the bat. Really quite earthy/yeasty with some grassy/herbal hops. Not punch you in the face hoppy, way more subtle. The second pour brought more of a hop presence as well as it's mildly toasty/caramel-y malt backbone. T: The taste didn't take as long to impress me but I did notice that its' true identity came about the warmer it got. This is a fresh hop beer where hop subtlety and malty complexity are the keys. M: Really pretty smooth and clean with a hint of hoppy spice. Finishes on the dry & herbal side of things with a hint of malt sweetness that lingers for a good while through the finish. D: This might've scored .5 higher in the drinkability if they'd knocked the abv down to somewhere between 5.5-6.5%. I realize that it's a special Smokestack Series beer and they're not really run-of-the-mill-just-in-a-bigger-bottle type beers, but the drinkability actually wore on me by the end of the bottle. Would love to try this brewery fresh on draft to compare! Poured from a C&C'd 750ml bottle into a Unibroue Tulip. This beer has only been on the shelf in KC for two days. It's been available for up to two weeks in other markets. Bottle opens easily with a nice soft pop. A: A medium pour yields a large cream colored foam. Foam holds up nicely before giving way. Subsequent pours reproduce the same level of foam. The beer is clear - but not brilliantly so - and amber in color. It looks like a pale ale, which is to say, forgettable. S: Grassy, herbal, spicy aroma with a tinge of floral / citrus. It's a hoppy smell, but not anything that will knock you off of your feet. T: Light caramel malt flavor cut nicely by a firm hop presence. A nice balance of hop flavor and bitterness. A slightly resinous flavor and feel, again with a slightly citrus twinge on top of the earthy hops. I worry that my hop sense needs to be re-calibrated after drinking too many IPAs and DIPAs. The hops are pretty subtle and blended in this beer. The bitterness is spot on and does a perfect job of cutting the initial sweetness of the beer. M: Spot on. No alcohol burn; a sweet start with a dry finish. D: Dangerously drinkable. This drinks like an APA, but weighs in at a slightly bigger 7.4%. I feel like I could polish off two or three of these 750s without even thinking about it. While I wish I got more aroma out of this beer, Boulevard 21st Anniversary Ale is really subtle and a stunning example of balance in a beer. Blvd21a is excellently crafted and a shining example of what Boulevard does so well. Kudos to Boulevard for making a beer to mark a major milestone that doesn't follow the herd of Barrel aged double mocha vanilla imperial stouts, and having the guts to put out a beer that everyone can appreciate. It's crazy to make a 'special' APA these days, but they knock this out of the park. A - Poured out a clear, copper color with a three-finger, khaki colored head of thick foam. It was long-lasting and left sticky, thin rings of lace. S - It smelled of tropical fruits, citrus and caramel. T - It had some spicy hops with a citrus kick and some sweet caramel malt. D - This is good but not great. It had a hoppy aroma that didn't deliver much of a bitter bite. And it had a muted caramel aroma but the caramel flavor dominated the taste. A- A bright, hazy orange liquid with numerous streams of carbonation. The bone white head is about half a cm thick and has some pretty good retention. S- Pretty aromatic with lots of cut grass and fruit aromas. I almost get a bit of a latex paint smell, but not in a bad way. T- Lots of grass and pine and fruit. The malt backbone is very nice. M- A very creamy body with a nice amount of carbonation on the finish ot keep it from becoming too heavy. D- For the ABV, this drinks pretty nicely. Recommended. Pours a cloudy red/orange color, with a craggy off white head that lasts forever and leaves great lacing. Smell is all thick, resiny hops. The malt is way in the back, adding an earthiness to accent the big, bitter character. Taste is much less bitter than I was expecting, with lots of hop sweetness. The bitterness comes in later, giving way to an earthy finish. A weirdness at the end indicates a slightly infected bottle. Mouthfeel is very carbonated, enhancing the bitterness and off flavors. Drinkability is decent, but I can't get over the strange finish. Orange-brown color with some nice highlighting, a murky body, and a decent tan head of medium-solid foam. Pretty good stick and a nice cragginess. Aromatic enough, with an interesting emphasis on German malts and American hops. I get quite a bit of sweetness of Munich and caramel malts, with a hoppiness of citric zest. Slightly grassy as well. Good marks so far. The flavor is a slight letdown for me, and this is pure personal taste. Munich malt is far from my favorite, and Magnum hops. More herbal than peppery, and grassy than citric, although each of these is in the mix. The Cascade and Centennial zestiness saves quite a bit of enjoyment for me. Mouthfeel is a little light on the bubbles, with the late sweet finish sticking around; body is pretty light for the beer is seems to be aiming for and way to chunky for an APA. This is an interesting brewing choice - too "big" to really capture what's great about a Pale Ale, not hoppy enough for an IPA, and not quite big enough for the catchall Strong Ale. However, kudos to Boulevard for taking the APA style (its original brew as I understand it) and going to places others won't. Fun and worth the effort/expense, but I shan't be purchasing another. Nose is freshly hoppy - pine, herbal, spicy, and citric fruity (candied orange). Smells good. Pours clear caramel with large bubbly head. Looks pretty good. Flavor follows with nice herbal spiciness and candied fruit tartness/sweetness. Soft bitterness. Moderate carbonation. Solid malt base, mild sweetness overall. Tastes good. Feels good. Good drinkability. Solid pale ale with hoppy balance. Overall pretty good. 21st Anniversary Fresh Hop Pale Ale from Boulevard Brewing Co.